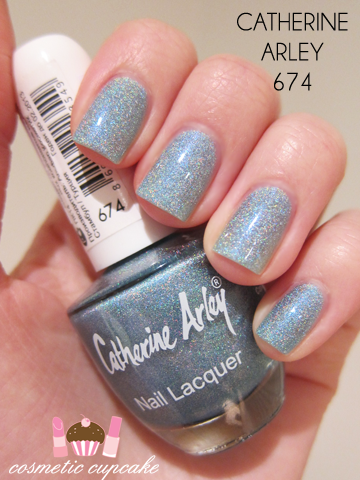 Christina very kindly sent me 674 which is a beautiful pale blue holographic polish. It is GORGEOUS! 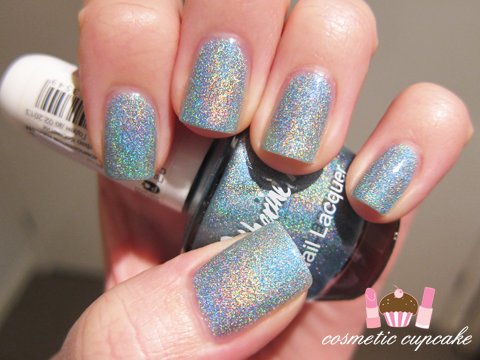 It's a pale blue so it's quite subtle and has just the right amount of holo. This is going to be strange, but when I have a holo polish on I tend to look at my nails a lot during the day and I just couldn't stop staring at this beautiful blue hehe. Unfortunately I didn't get any pics in sunlight which is a shame. I am very impressed with the wear too being a holo. I applied a coat of Color Club Vivid Intensifying topcoat after I took these pics (it wasn't dulled by topcoat if you're wondering) and I was very rough to my nails at work and I did not get one chip or tipwear at all. Holos don't tend to last very long on me unfortunately so I was stoked! I'm off to make googly eyes at the wondrous creature that is Adam Levine x) Thanks for looking as always!! You have such nice shaped nail beds. Your nails look really pretty. How do you think this polish compares to Nfu oh? This is such a gorgeous colour Michelle!!!! wow, that is probably the most glistening polish i've seen, i love it!! This colour is beautiful :) Silver nails are so amazing. Enjoy the concert! Maroon 5 are soo good, Im jealous! This polish is gorgeous. Where can I buy this polish? I'm in the US. Beautiful polish and looks great on you! Any idea where I can find it?